When people learn that I have a doctorate in Holocaust History and that I work at the JFCS Holocaust Center, they often follow up with a question such as, isn’t that depressing? Admittedly, studying genocide is more emotionally draining than, for example, taking a job as a pet photographer, but over the past decade I have heard from and learned about people whose stories of heroism, selflessness, and bravery, sustain and inspire me to continue my work in genocide education and activism. In honor of Genocide Awareness Month, I want to share with you some of the stories of heroism and resistance that nurture my belief that humanity can prevent and eradicate genocide. Armin T. Wegner arrived in Ottoman Turkey as a member of the German Sanitary Corps in April 1915 following the military alliance between Germany and Turkey during World War I. 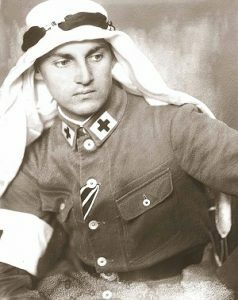 While on leave from the Germany Sanitary Corps, he defied orders by investigating the rumors that the Ottoman Turks were massacring Armenians and forcing them on death marches. Despite the great risk it posed, he spent July and August photographing the destruction of Armenians and collecting documents and further evidence of the mass murder of Armenians. Thanks to Wegner’s work, we now have photographic proof of how 1.5 million Armenians were murdered by the Ottomans, which is all the more important given the Turkish government’s present day denial of the genocide. Wiktoria Rodziewicz, a Christian Pole, put her life in danger when she offered to hide a Jewish mother and child from almost certain death. Prior to the German occupation of Poland, Rodziewicz worked for a Jewish family. When the Germans forced Rachela Krynska and her 21-month old daughter Sarah into the Vilna ghetto in the summer of 1941, Rachela reached out to Wiktoria to see if Sarah’s former nanny would agree to hide Sarah. By this time, Rachela had learned that her husband had already been murdered and she was determined to save her daughter. Incredibly, Wiktoria agreed and even offered to hide Rachela, too. Rachela feared her presence would put Sarah at greater risk so she remained in the ghetto and placed her daughter in Wiktoria’s care for the rest of the war. Wisely, Wiktoria baptized Sarah to secure Christian papers for the child, changed her name, dyed her hair blond, and claimed Sarah as her own illegitimate child. Had Wiktoria been discovered harboring a Jew, she would have been killed. After the war, Wiktoria reunited Sarah with her mother. On May 24, 1977 Yad Vashem recognized Wiktoria Rodziewicz as a Righteous Among the Nations. I first learned about the heroism of Wiktoria Rodziewicz from Alix Wall, a member of the JFCS Holocaust Center’s William J. Lowenberg Speakers Bureau who is working on a film about her family’s Holocaust past. When the Rwandan Genocide erupted in April 1994, Hutu civilians collaborated with government forces to murder some 800,000 Tutsis and Hutu resisters like Sister Felicitas Niyitegeka. Despite the danger that helping Tutsis posed, Sister Niyitegeka and the sisters of Centre Saint Pierre endeavored to shelter Tutsis and helped dozens cross Lake Kivu to relative safety in neighboring Zaire (now known as the Democratic Republic of Congo). Sister Niyitegeka’s brother, a colonel in the army, advised her to abandon Centre Saint Pierre during the genocide, but she refused, saying she would rather die than forsake those in need of protection. When the Interahamwe (a paramilitary group and key perpetrator of the genocide) arrived at the Centre, they told her they would spare her life because of her brother, but true to her word, she refused to leave her sisters and her Tutsis charges, so she too was murdered. Having spent over a decade learning and teaching about genocide, stories like those listed above have become my touchstones of hope. 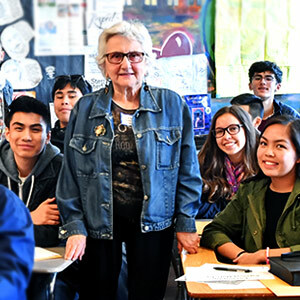 In fact, the exercise of trying to pick just three examples among thousands has reminded me why I have devoted my life to genocide education: I believe in the human capacity for good and evil; even during the darkest chapters of history when it seems as if evil has strangled all that is good, good still exists. John Cooper, Raphael Lemkin and the Struggle for the Genocide Convention. Palgrave Macmillan, 2008. Emmanuel Katongole, Resurrecting Faith after Genocide in Rwanda. Zondervan, 2009. Kristina E. Thalhammer, Courageous Resistance: The Power of Ordinary People, Spring, 2007. Donald E. Miller and Lorna Touryan Miller, Survivors: An Oral History of the Armenian Genocide. University of California Press, 1999.